Have you ever stirred a cup of coffee by swirling the cup in a circular motion, without actually rotating the cup? You have, and it works, right? 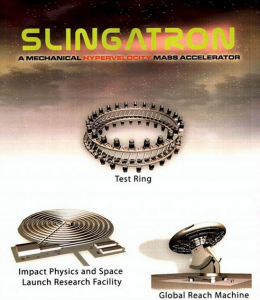 Well, the Slinga-tron depends on the same principle to impart escape velocity to a payload. Essentially, the device will consist of a coil, in appearance much like a compression spring.To make this method work, a payload is inserted at the base of the coil, and the entire coil is then swirled around just like the coffee cup, but without rotating it. By manipulating the amplitude of the coil’s gyrations, the payload is accelerated on the basis of the displacement of the load in the direction of the centripetal force that is acting on the payload. The nett result is a continuous acceleration of the payload, but the rate of acceleration is directly proportional to the payload’s mass. 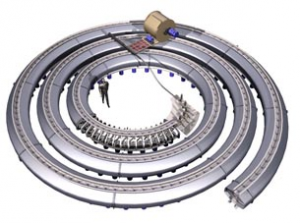 The idea sounds good in theory, and it might even work, but the problem with it involves the complexity of the mechanism required to initiate, and control the gyrating motion of the entire coil, which could weigh several hundred tons. To date, no viable designs for the controlling mechanism have emerged.